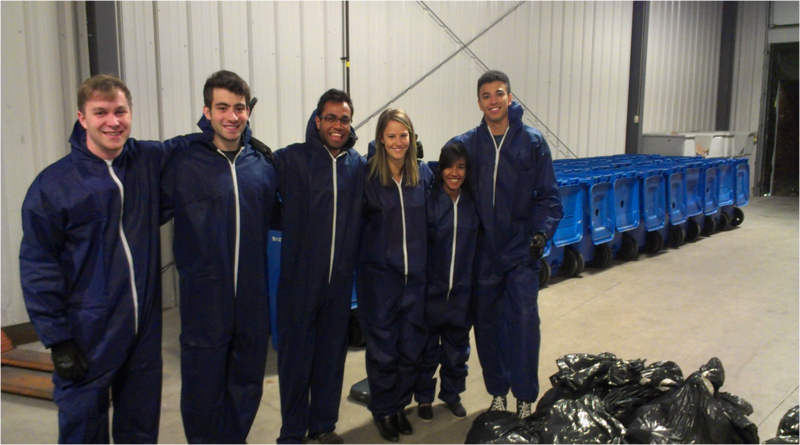 Last week, the Ivey Sustainability Club hosted a Waste Reduction Challenge. Eight groups of first year students (approximately 500 in total) were pitted against each other to see which group could improve their waste diversion and reduce their total waste output by the most. During a baseline audit the week prior to the challenge, the students already had an impressive diversion rate; 84% of what was thrown away was truly garbage (meaning only 16% should have been thrown in the recycling). However, they were able to improve this number even more during the challenge week, and brought their diversion rate up to 90% (with only 10% of the items thrown away being recyclable)! This was made possible due to the diligent work of the Ivey Sustainability Team. They went in to each of the eight classrooms, ensured that all students understood what could and could not be recycled on campus, and suggested ways to minimize waste. The biggest contribution by volume to the garbage stream at Ivey was Starbucks coffee cups. Unfortunately, these cups are not recyclable, so reusable mugs were suggested (Hospitality Services offers a 10 cent discount on beverages served in reusable containers). The largest contribution by weight to the garbage stream was organics; primarily food waste. This made up for almost half of the weight of all of the garbage. To this end, public composting options are currently being evaluated for the building. Over all, the Waste Reduction Challenge was a huge success. It is anticipated that the waste diversion and minimization skills the students picked up during the week will be extended far past the challenge and become life-long habits. If you would like to organize a waste reduction challenge for your group of students, faculty or staff at Western, email sustainability@uwo.ca.